SINGAPORE - To help teachers better respond to the changing needs in education, the one-year teacher training programme for degree holders at the National Institute of Education (NIE) will be extended to 16 months. The additional four months for the Postgraduate Diploma in Education programme will be used to provide more hands-on practice in the classroom and additional courses. Currently, trainees are sent out to the classrooms for 10 weeks towards the end of their programme. Now, an additional four-week practice stint will be introduced earlier in the course. During the four-week stint, the trainees, called pre-service teachers, will return to NIE one day a week, and take part in discussions to help them better understand their role as teachers and strengthen their application of theory to practice. NIE will also introduce new courses on the role of the form tutor and to build their capabilities for deeper engagement with parents. Another new course, "Singapore Kaleidoscope", will help teacher trainees gain a rich, multi-faceted perspective on Singapore. The batch that starts its training in December 2016 will be the first to go through the new expanded programme. 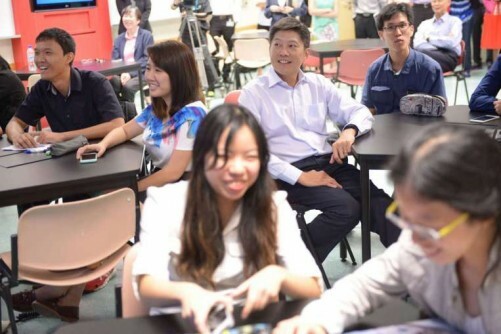 Acting Minister for Education Ng Chee Meng, who announced the change this afternoon after visiting NIE, said that Singapore's teaching force is of high quality. He has met many teachers in the last two months since taking up the education porfolio. "I am deeply impressed by the commitment, dedication and heart for their kids," he said. He added that "given the complexities of the world ahead and future challenges", there is a need to deepen and expand the teacher training programme. He said the new programme will give them a better introduction to teaching, broaden their scope of learning and allow them to contextualise what they learn in the classroom. It will also enable teachers to better meet the needs of diverse learners. Director-General of Education Wong Siew Hoong said the new programme is aligned with the aim of the Ministry of Education and NIE to develop teachers who are not only grounded in their professional skills, but are reflective and capable of inquiring into their own practice. "All these will uplift the quality of teaching and learning in our classrooms, strengthen our work with our students and help our students develop competencies needed for the future," he said. Professor Tan Oon Seng, director of NIE, said there is a need to prepare teachers for a more complex world. "The additional investment allows for better consolidation of professional learning and thinking as well as opportunities for deeper immersion into practice. With more time, pre-service teachers are also able to engage in more collaborative activities, develop stronger collegial bonds and build peer learning communities for longer term professional growth." The Straits Times recently reported the MOE had scaled back on the recruitment of teachers after exceeding its target of recruiting 33,000 teachers. This year, it is likely to recruit only 900 teachers, a drop from the 1,300 teachers it hired last year. This year's number is a big drop from the peak of its hiring drive in 2009, when 3,000 teachers were recruited. MOE said it had expanded the teaching force significantly, and its focus now is on replacing teachers who have left the service and recruiting more teachers in specific subject areas.